What happens when part of your life comes to a screeching halt? Like when you get laid off, fired or let go from the team? What would you do with your time while you sit on the sidelines of life? 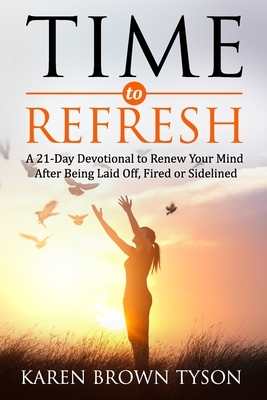 Time to Refresh: A 21-Day Devotional to Renew Your Mind After Being Laid Off, Fired or Sidelined is writer Karen Brown Tyson's journey through the Bible following one of three layoffs in her life. As part of this 21-day devotional through the Bible, you will learn how to use the G.L.O.W. process -- gratitude, listen, observe and witness -- to help you renew your mind during tough times.